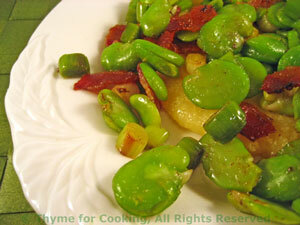 Warm Fava Beans, Green Garlic on Polenta, Thyme for Cooking simple starter. Fava beans are one of the first spring vegetables to appear at the local markets. They are a bit of work to prepare, but not at all difficult, much like fresh peas. If you can't get them substitute edamame or white kidney beans. Break open the pod and take the beans out. Don't bother with any really tiny ones. Blanch in rapidly boiling water for 30 seconds. Drain and put into cold water. After blanching they will have a whitish outer shell. Just squeeze lightly and the inner, bright green bean will pop out. It may split in half... that's okay. Remove from heat, cover to keep warm. Heat 1 tsp olive oil in a medium skillet. Add the bacon and fry until light brown and crisp. Drain off all but 2 tsp fat. Add the green garlic (or onion and garlic) and stir-fry 1 minute. Add the fava beans and heat through. Spoon polenta into 2 flattish soup plates. Spoon fava and green garlic on top, drizzle with truffle oil and serve.